The best classic SAAB 900 Turbo performance intercooler kit on the market! 900 turbo. An icon infinitely popular as enthusiast vehicle, yet so few performance parts are available. 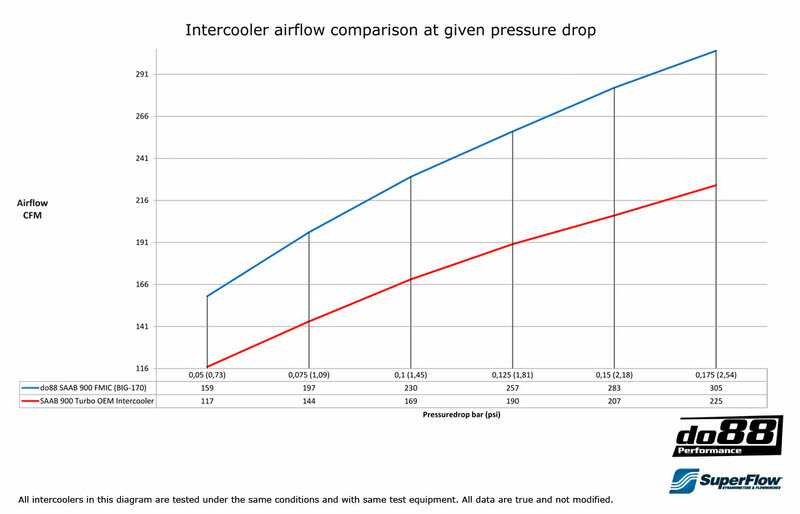 We have done our part to change that and are proud to present this intercooler package! We saw a room for a more exclusive, thought through and elegant model adapted intercooler, with suiting pipes and hoses. A solution worthy of this icon. We are satisfied with the outcome – we think you will agree! - Excellent cooling performance and low pressure drop! - Fits without AC, model year -1986 with the old front. - Compatible with AC, model year 1987- with new front. - Compatible with the battery in the original position. - New towing eye included (originals must be cut away). Always remember that the OEM intercooler was designed for the power level the car was built for originally. A power increase or even very hard use of the car in standard version, may cause the OEM intercooler not having the performance that you need. So only after an engine software tune the do88 BigPack will give a performance increase over the OEM intercooler! A common misunderstanding is that an intercooler installed in this position cannot provide good performance and that a front mounted intercooler / FMIC would be much better. But actually the do88 BigPack is far better than most FMIC installations where only a core with a small front surface is possible to install, partially behind the bumper beam which will reduce cooling capacity even further and often cooling abilities worse than the OEM intercooler are achieved. Select the model year your car fits within.